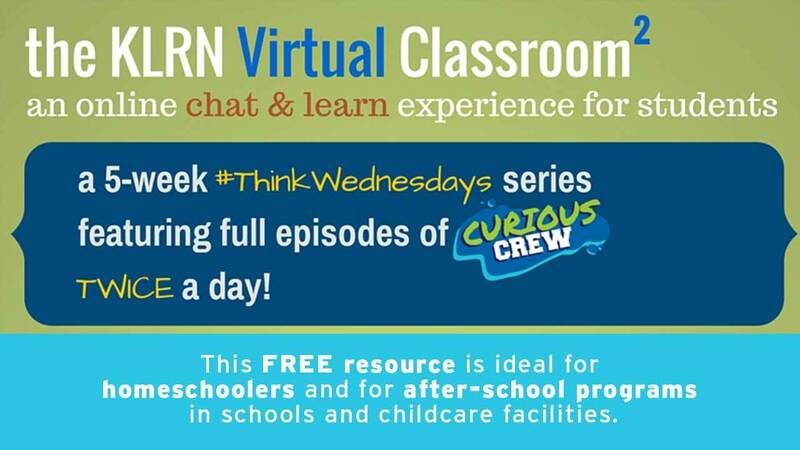 The KLRN Virtual Classroom is embracing #ThinkWednesdays and offering one classroom TWICE a day to reach those DURING and AFTER school. This is a great series for homeschoolers during the day whose schedule might be more flexible and for after-school programs in the afternoon so students can engage in FUN learning. For this series we will watch FULL EPISODES of the PBS/WKAR program, Curious Crew. The Curious Crewmembers are young explorers from across mid-Michigan as the setting for the show is Impression 5 Science Center in Lansing. The host is award-winning educator, Rob Stephenson. Each week we're joined online with Jennifer Crispin, program coordinator at Impression 5 Science Center. Jennifer answers questions regarding the topics featured throughout the program. Join us and share this link with a school, a co-op, or any educational program that you know about who might want to CHAT & LEARN with us.